The Collective may be one of the few places I really like to go to because it's super near from where I live in Makati and of course, the place houses a lot of specialty shops and hole-in-the-wall restaurants that I'm excited to try. I've been to Wingman a couple of times before as well as Mochiko. I don't know what happened with Offbeat though. Everytime I'm at The Collective, it's always closed. I was trying to access their Facebook page but it always comes up as not found. Anybody got any updates? It was a really, really busy night at The Collective and I just want to have dinner before I go to work. Peeking through the windows, we found an empty spot and immediately went inside bamm. I assumed they serve Mediterranean food so it's fine with me. I had no idea what to order and I had no idea what the items on their menu look or taste like. Hahaha. (From what I've read now on their Facebook page, they serve German-Turkish food.) I'm just very, very hungry that time and I wanted to eat anything with rice. So we ordered potato chips, Beef Doener with Rice Pilaf for him and Beef and Chicken Doener with Rice Pilaf for me. People are coming in non-stop until it came to a point that they can't accept customers anymore because the resto was full. I took pictures while waiting for our food to be served. I must say though that their staff was really friendly, attentive and accommodating. I'm not sure if there were only 2 of them that night. Our food was finally served, the food attendant was apologetic because we had to follow up our orders. Well, can't really blame them, they were swamped that night. Nothing really extraordinary about them. Thinly sliced crispy potatoes that came with a dip. But I thought it was odd dipping them in that sauce. I actually liked this one. 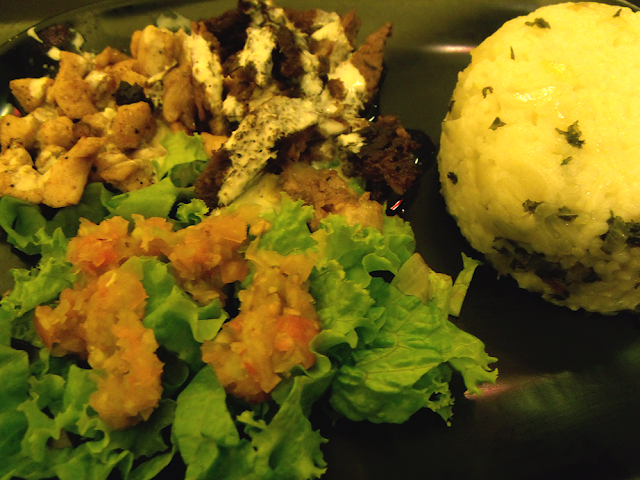 Both the chicken and the beef were really tender, tasty and yummy. But the only problem I had was the supposed rice pilaf. The rice was just too sticky and it tasted just like ordinary rice. I had a hard time finishing the rice so I just devoured the beef and chicken. Overall, not a very satisfying meal for us here. 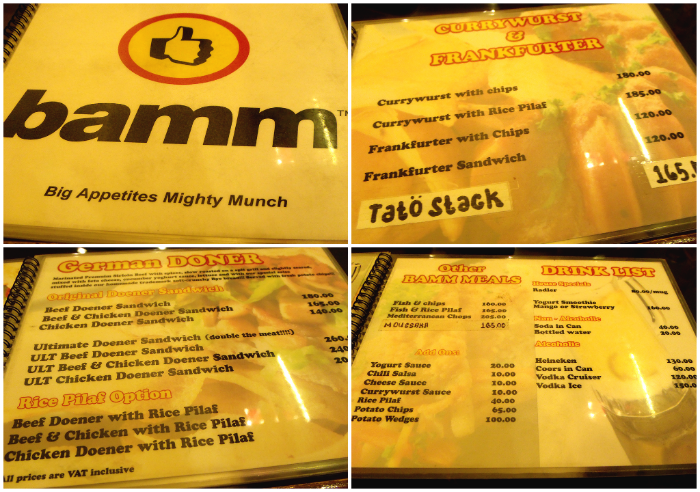 But we'd still comeback to try their currywursts and frankfurters, maybe that could change our initial impression with bamm. Ah!dobo. 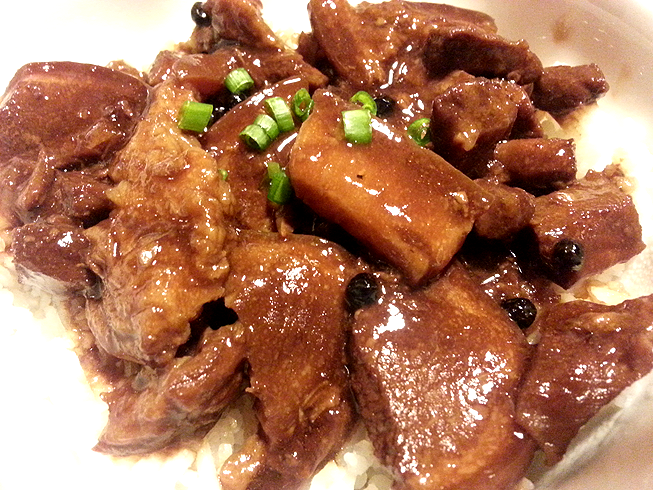 Pork simmered in in soy sauce, vinegar and aromatics. I know it doesn't sound that special but that time it was stuck in my head. And I was really excited to try it. Chance finally came about a week ago. Fritzie and I both stayed for the weekend at our unit so we went to Kubyertos at around 11 pm for dinner (LOL we woke up really late that day night). The place was actually almost full that night but most customers left by the time we placed our orders. I like the place! It's so spacious and the atmosphere feels light. They got this wall of what seems to be bowls (I think) and all their chairs and tabled were made from wood. Of course I ordered Ah!dobo (PhP 130)! Serving was quite big (yay), pork was really tender and tasty. The viand was served on top of hot rice! Yummmm. It was really delicious and filling. I finally satisfied my craving! 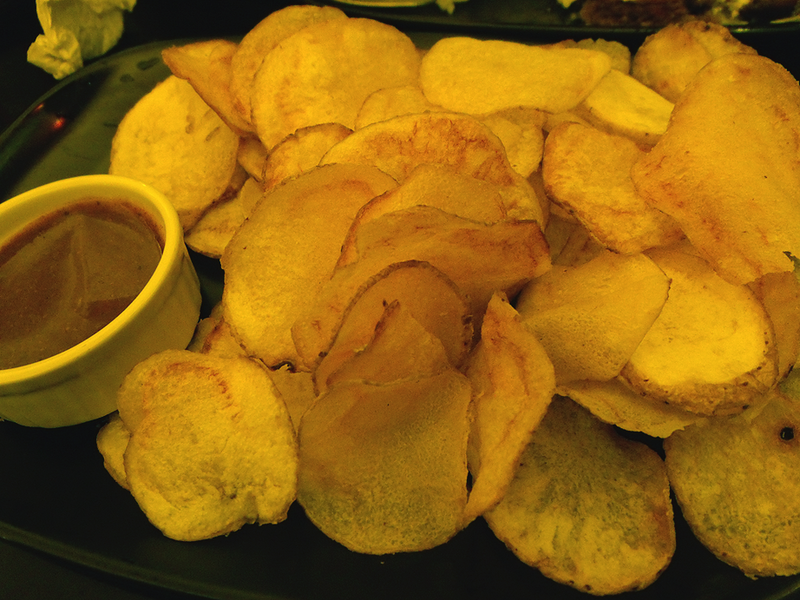 Fritzie's pick that night was SisigTri (PhP 180), sisig was wrapped then deep fried. She paired this with a Manila Beer (that was the only beer available). I was so busy (and contented) eating my adobo that I almost forgot to taste this. I tried a piece and it's actually pretty good. 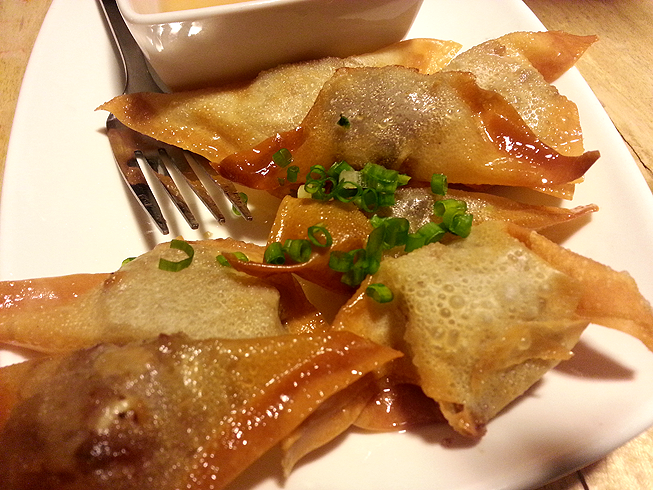 It's perfectly crunchy and the sisig filling was tasty. They could fill it up more though. SisigTri is definitely a great pulutan. 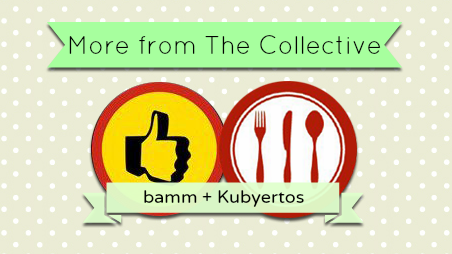 You may visit bamm and Kubyertos at The Collective. 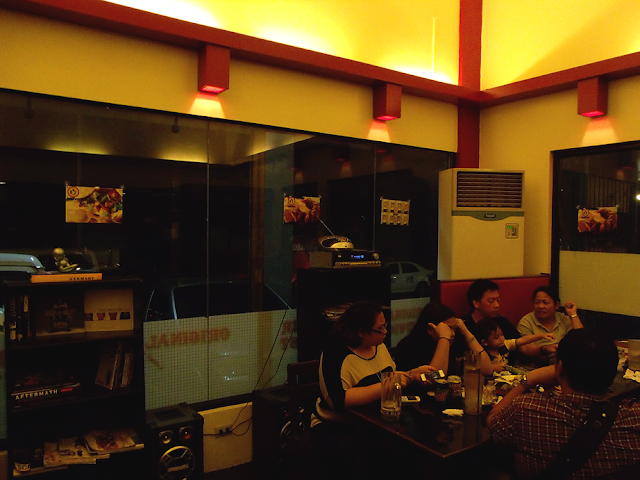 It's located at 7274 Malugay St. San Antonio Village, Makati City.